ANRC offers a variety of activities to meet the physical, social, emotional and spiritual needs of our residents. Activity staff members lead physical activities to promote residents strength and mobility as well as cognitively challenging programs to exercise the mind. 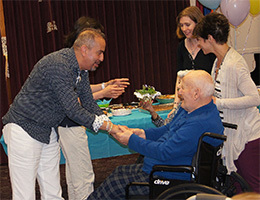 Residents also enjoy social events with musical entertainment, groups that promote creativity, a variety of religious services and discussions that encourage reminiscing. Residents are motivated to participate at their highest level to encourage personal satisfaction and promote continued independence. Download a pdf of our April resident activity calendar.